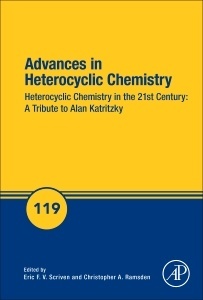 Directeurs de Collection : Scriven Eric, Ramsden Christopher A.
Heterocyclic Chemistry in the 21st Century: A Tribute to Alan Katritzky, the latest volume in the Advances in Heterocyclic Chemistry series, is the definitive resource in the field?one of great importance to organic chemists, polymer chemists, and many biological scientists. Because biology and organic chemistry increasingly intersect, the associated nomenclature is also being used more frequently in explanations. Written by established authorities in the field from around the world, this comprehensive review combines descriptive synthetic chemistry and mechanistic insights to yield an understanding of how chemistry drives the preparation and useful properties of heterocyclic compounds.